We took a bus from our resort to the Mayan ruins of Cobá. Margaret was very interested in doing this, and it worked out great. Cobá, one of the oldest Mayan settlements on the peninsula, means "waters stirred by the wind" This name is most likely derived from the five lakes in the vicinity. Cobá was a thriving city during the Classic period (600-900 A.D.), although it had been settled for around a thousand years before this span. 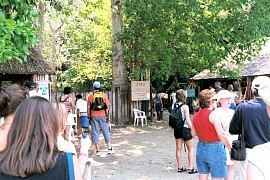 We paid $75 each (American) for the five of us to go on the day bus tour to the Cobá Mayan ruins. This price included lunch. We left at 8:40 a.m. and returned to the resort at 6 p.m.. This site is very large and still being explored/restored. The tour included a very nice bus, driver, and tour guide. On the map, our resort - Barcelo' Mayan - was located just south of Puerto Aventuras. 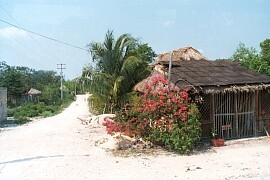 We had about an hour bus ride to the first Mayan town. The first ones along the road have electricity, the ones later on in the day do not. This house along the road is taken through the bus window. Note the satellite dish on the business on the right. 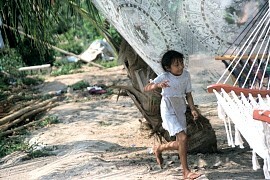 This Mayan child running in front of a billowing sheet caught my eye. A view done a village street. Note the power poles. I didn't show our stop at a Mayan restaurant/gift shop. The bathroom had a modern toilet, but no toilet seat, just the rim: no flush mechanism, just a twist valve in the back. Even so, it was better than going to the bathroom in the jungle .... Here is the entrance to the Cobá site - the guide paid our collected money and handed out mosquito lotion which she brought along to share with us. I never noticed a mosquito - it must have worked. 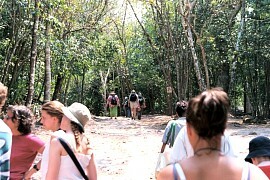 We have about a mile to walk through the jungle before we reach the main pyramid. The day was hot, but not impossibly so. You could rent a two-seat bicycle taxi for 75 pesos if you didn't think you could make the walk. Everywhere the Mayan's built a large structure, they left a carved stone nearby with carvings that explained what the structure was, etc. Here is one of these stones housed in a little shack. 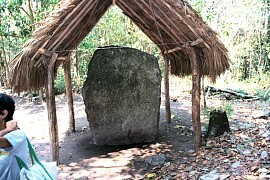 The stone is called a "stelae" and it is protected by a palapa roof. Look at the very far left corner - see the "O" sticking out of the smooth stone surface? This is a Mayan ball court, where a game with a large rubber ball was played. Using their hips, they had to bounce the ball through the small hole. This picture shows the back side of the court: male spectators stood at the top and watched. The guide said the spectators who backed the losing team had to give up their jewelry and clothes to the winning teams' backers. 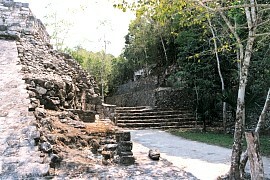 This is the view just past the ball court ruins which will prove to be a tall pyramid structure. 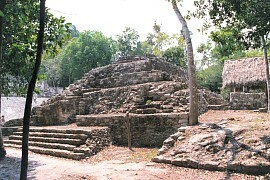 This first group of structures (Groupo Cobá) is within view of the entrance. 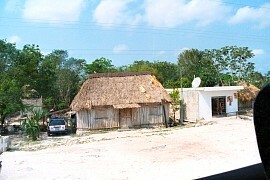 On the right is La Iglesia, a pyramid over 65 ft (20m) high and the second largest at Cobá. The steps are steep and crumbling, and climbing had been prohibited (they used to let people climb this one but no more). We will see this one from the front in a little while.